Today's card is one I created for a class I'm teaching this week using the More Than Chocolate stamp set from Stampin' Up. I was looking for ideas and inspiration, and came across the Freshly Made Sketches 301 sketch, after seeing Kristie's card inspired by the same sketch. 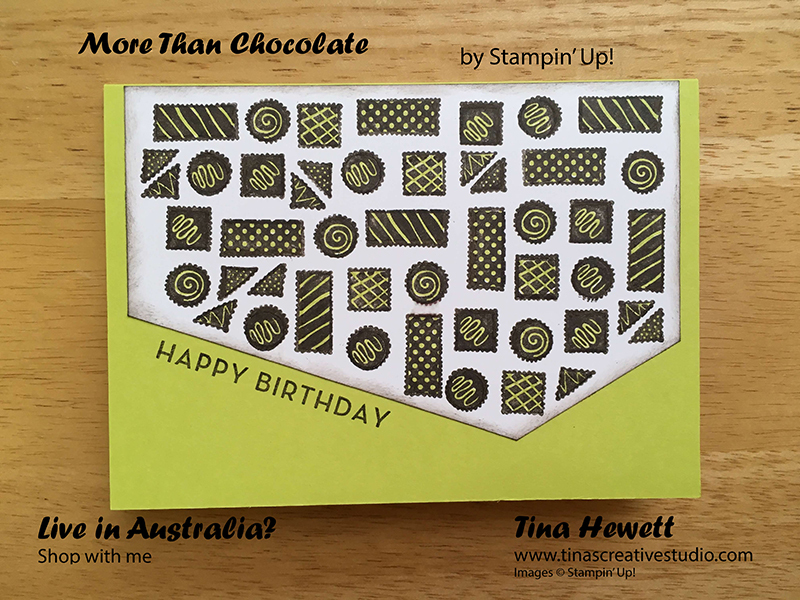 Kristie's patterned piece was created with a stencil, mine was created by individually stamping the various chocolate stamps from the More Than Chocolate stamp set in Early Espresso ink on a piece of Whisper White cardstock. I then used a Lemon Lime Twist marker to fill in the patterns. I sponged the edges of the patterned piece with Early Espresso ink, and attached it to my card base. 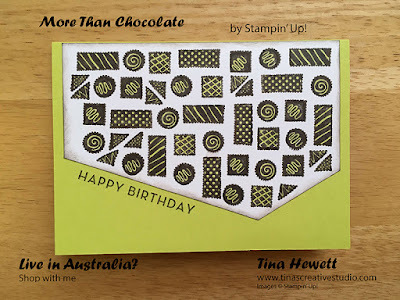 I used a simple greeting from the Big on Birthdays stamp set from Stampin' Up, also stamped in Early Espresso. The card base is Lemon Lime Twist cardstock, one of the new In-Colours for 2017-2019. Here are the supplies I used to make this card. If you'd like to purchase any of the supplies, please click on the image and you will be taken to my online shop.